Live, Laugh, Teach First Grade: Classroom Tour Part 2 (13/14) School Year! Okay, so I was looking through my pictures and I found some more classroom pics from the beginning of the school year. You know when the classroom is nice, clean, and organized! Oh yes, I love me a clean room. There are also pictures of my whole room, which you didn't get to see in my last post. Majority of the stuff you see I made myself. I love polka dots and bright colors. If there is anything you like that I don't have on my TPT Store let me know! Here is my outside bulletin. Unfortunately, our Fire Marshall only allows 20% of our hallway walls to be covered, so we aren't allowed to cover them with paper. Luckily, our boards are a real pretty color. Good thing that rule doesn't apply in the classroom. Here I put clothespins under each owl to hang their work. Each little owl has a student's name. Here's my outside bulletin. It says "Look Whoo's In 1st Grade." Here is the entrance view of my room. There's my baby boy Giovanni, he had multiple surgeries on his leg last summer. Here is my work area/ my small group meeting area. Here is a view of my Writing Station and Math Focus Wall. I have what I call "detachable bulletin boards." I buy boards and make permanant displays. I then velcro them to the wall. The green/ white and the pink displays are both detachable. I will post on that process soon! Here is my Interactive Whiteboard. Please excuse the wires, I hate those wires. Here are my student desks. Each set of tables holds 4 students. In the center of their desks are caddies which hold crayons, pencils, scissors, morning journals, highlighters, etc... I do not allow my students to any supplies in their desks. I've learned from experience, that my little ones will have broken and loose crayons all in their desk. Oh, and no personal sharpeners allowed, this causes lots of mess with the pencil shavings. To the right is my Science Bulletin, followed by my ELA Focus Wall, then to the far left is my Word Wall. Keep in mind this was at the beginning of the school year, so not much hanging yet. Here's my rotation chart for Math and Literacy Stations. I put students into groups 1-5, then I just move the numbered cards down to switch their stations for the day. I have 15 Lit Stations in all, by the time Friday comes, they have all gone to every station at least once. I eventually changed those numbered cards on the right to clips, it was more convenient. This is my Work Station Groups. I use clips to sort my students, this definitely makes it easier when switching students to different groups. My students work a lot with their groups, even on things besides work stations. How We Go Home Display to the right with numbered clips as well. My door way, and to the left another detachable bulletin board which will end up being my birthday board. Underneath is my Math Tubs, Word Work Station Tubs, and the journal and folder bins. Here is my Computer Station, and to the left my Objectives Chart. I purchased the TEK cards for each subject on TPT. I change them out weekly. Here is a closer shot of my work area. To the left is My Reading Group Display. This also will use numbered clips to sort my students into their groups. Again, if I need to move a student to a different group, then I just simply move their clip. A view of my whole room. Sorry about the blurry pic, but this is my Science Station Display. I made the scientist on the right. We call him "Safeman." Sorry, another blurry pic. Here is my library station. I've said it before and I'll say it again, you have a beautiful, well-organized classroom. I know children learn the best from you everyday. 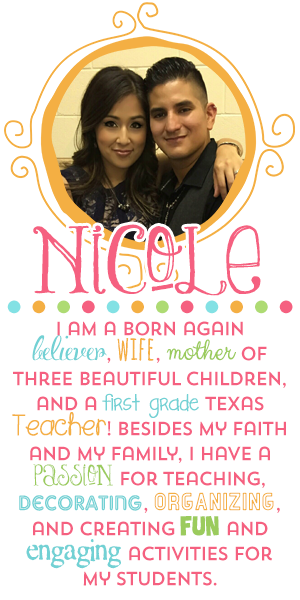 I'm proud of you Nicole. Keep up the excellent work!